We’ve all heard about how bad the flu is this season. You probably feel like everyone around you has already gotten sick. There are several ways to protect yourself and your family from getting this monster of a flu. These are some simple, easy steps that have a big payoff…a healthy you! Some may seem like common sense, but you’d be surprised about the things we forget when we get busy. We hope you stay flu-free! 1. Wash your hands frequently with warm soapy water for one minute. 2. Use antimicrobial hand sanitizer and hand wipes. These come in especially handy when a sink, soap and water aren’t around. Look for hand sanitizers that score well in safety ratings. Use the wipes to sanitize places you must touch in public that are commonly touched by others. 3. Avoid dehydration. Always keep plenty of water with you. Dehydration can lower your immune system, leaving you more susceptible to illness. 4. Keep a regular cleaning routine. Keep the cleaners coming. Maybe even bump up their visits to once a week during flu season. If you do your own home’s upkeep, be sure to give it a good clean every week. 5. Get a flu shot! Nothing will protect you more than getting your flu shot. Protect yourself and protect those around you by being proactive about this. 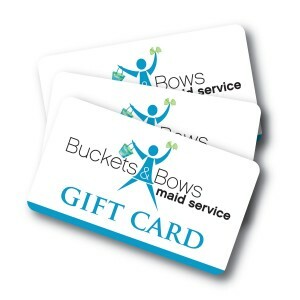 Here at Buckets & Bows, we decided to pay for flu shots for all of our office and cleaning staff.